If you can't count on your sump system to be powerful or reliable enough, then you can't count on a dry basement. And what good is the space if it gets wet? At Systèmes Sous-sol Québec, we install only the best sump pump systems available anywhere in the province of Quebec. We have an answer to clogging sump pumps, power failures, torrential rainfall, and much more! We service Montreal, Quebec City, Lavalas well as Gatineau, Longueuil, Sherbrooke, Levis, Trois-Rivieres, Terre-bonne, Saint-Jean-sur-Richelieu and nearby. We can help you dry your basement! For a free sump pump system quote, call or e-mail us today! 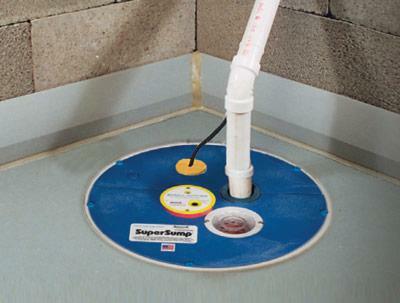 At Systèmes Sous-sol Québec, we offer two different sump pump systems: the TripleSafe™ and SuperSump®. Long-Lasting UltraSump® Battery Backup System -- In the case of a tripped circuit, power outage, or sump failure, your TripleSafe™ also includes an UltraSump® Battery Backup System. This heavy-duty battery backup can pump more than 11,500 gallons (42,532 liters) of water on a full charge. A second battery can be hooked up to a single system for an even longer running time. Optional Battery Backup Pump -- For protection from sump pump power outages or pump failures, we highly recommend that you install an UltraSump® Battery Backup Sump Pump. An additional battery can be installed on a single UltraSump®, allowing for double the pumping time.